Because many of you weren't around when Nigel and Mimsey were adopted by my parents, I thought I would share their adoption story again. It's a pretty sweet tale, so even if you've read it before, I hope you take a minute to give this feel-good story another read! This story begins nearly a year ago. My parents were visiting us for the holidays, and they had a chance to spend a little time with Walter and Ira Finch. My parents had met plenty of other litters and enjoyed each one, but there was just something about Walter and Ira that really tugged on my Mom's heart strings. If the timing would have better, she would have left with the pair tucked under her arm. Long after they returned home, she pined for these kittens, and if they came up in conversation, with a lump in her throat, she would express her regrets for not figuring out how to make them hers. Fast forward one year and Nigel and Mimsey move in with us. I posted their pictures on the blog, and later that day, Mom called expressing an interest in this pair. I think it was Mimsy's resemblance to Walter that got my mom's attention initially and Nigel's floof that sealed the deal. We had a long talk about how we could make it happen but couldn't put the plans into motion because my dad was on a dive trip, and he, of course, would have to agree to the plan. We patiently waited for his return, and the day after he got home, my mom asked if he had seen the new kittens on my blog. She showed him the posts, and then she gently asked him "what would you think if we adopted those kittens?" After a very brief discussion, and with very little persuasion, he agreed. The next hurdle was figuring out a plan to get them back to Iowa. Fortunately, my friend Kim (AKA Charlene's foster mom) works for American Airlines and commutes to Chicago several times a month for work. I gave her a call to find out if she would want to be a kitten mule and help us get the babies back to the Midwest. Of course she agreed - she's a kind-hearted person and lover of kitties. She checked with the higher-ups to figure out all the necessary steps we needed to take to get the babies on board. It all seemed logistically possible so the adoption paper work was mailed back to Iowa to be filled out, a special carrier designed for airline travel was purchased, and a delivery date was decided upon. We just had to fatten up Nigel, get them fixed, and get them to the airport. The next two weeks, while we waited for Nigel to make weight, were filled with many phone calls and email exchanges. These would be my parents very first kittens, and there were many questions ranging from eating and litter box habits to my personal favorite, "what do kittens smell like?" My mom was a nervous new mom. How sweet. She went out shopping with my Aunt Sue (local cat expert) to buy all the needed supplies. She prepped the house and moved plants and knick-knacks out of kitten's reach. They were as ready as they could possibly be. And finally, the kittens were fixed and ready to go. I drove Kim and the kittens to the airport bright and early on Saturday morning. The kittens were very good and hardly peeped at all during the 40 minute drive to the airport. We parked, and I walked with Kim and the kittens up to security. We said our goodbyes, and off they went. I watched as they passed through the screening. 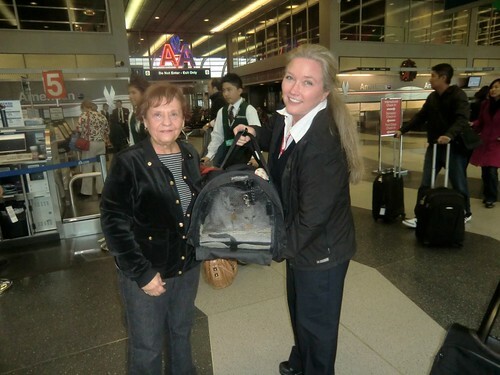 Kim had to pull them out of the carrier and held one kitten under each arm as she walked though the metal detectors. I was too far away to hear the conversations, but could see by the expressions on the faces of the TSA employees that they were delighted by these tiny travelers. They were loaded back into their carrier, and off they went to their gate. Kim called to let me know they had been assigned a seat, took photos with the crew and pilots, and settled onto the plane. I texted my folks, who were on their way to Chicago, to let them know that everything was a go. The kittens traveled very well and napped in their carrier beneath the seat nearly the whole flight. Kim took them into the bathroom midway through the trip to let them run around a bit and stretch their legs. After a little exercise, both kittens took a moment to take a quick bath before returning to their carrier. They had a little lunch, a little drink, then back to sleep they went for the remainder of the flight. 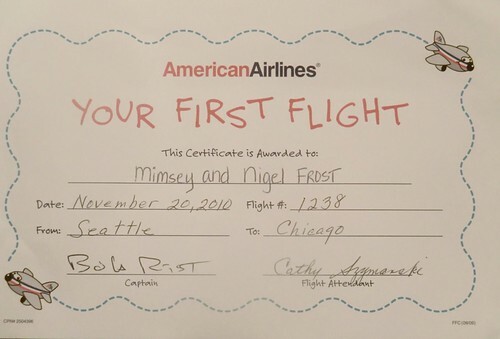 According to Kim, they were perfect little angels, made many, many friends on the plane and upon departure, received this certificate. My folks met up with Kim near the American ticket counter. There were many hugs, smiles, thank yous, tears of joy and the kittens were turned over to my parents. They chatted for awhile, hugged some more, then Kim left for her gate, and my parents headed to the parking garage with the babies. Once in the car, the kittens had a chance to use the litter box, have a little snack, and roam around for a bit. When everyone settled, they headed off to Iowa with my dad as chauffeur, and Mom in back with the babes. Nigel curled up in the carrier and slept the the whole car ride home. Mimsey spent most of the trip sitting on Mom's shoulder, watching the cars go by. Eventually she settled into Mom's lap and napped until they pulled into the driveway. It was a very long journey - nearly 12 hours from our house to my parent's - and the kittens did remarkably well. There wasn't a single glitch or problem along the way. I'm so grateful it was so easy, and not a bit stressful for any of the parties involved. Honestly, I couldn't imagine it going any better than it did. 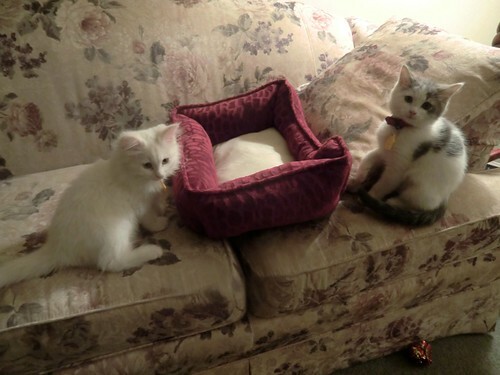 So, now the kittens are all settled into their new home. It sounds as though they're having a wonderful time exploring the house, and looking out all the windows. My parents have a ton of bird feeders in the back yard which attract all sort of of critters and the Frosts are thoroughly enjoying watching all of this action. And my parents are thoroughly enjoying watching the kittens. I'm so happy that these kittens are making my parents so happy. I've talked to my mom at least a dozen times in the past couple days and she just keeps saying "they're such sweet, sweet babies". And even though he's probably not saying it, I know my dad is feeling it, because he's just a big ole softy when it comes to critters. According to Mom, the Frosts settled right in, and are acting like they've lived there all their lives. It's nice to hear how quickly they adjusted to their new surroundings. Nice work kittens. You make me proud. This post is getting a little lengthy, and I need to wrap it up, but before I do, I just wanted to say thanks to Kim for making this journey with the kittens. I appreciate SO much all the strings you pulled to make this happen. THANK YOU Kim for all you did to get the kittens home safely. You're the world's greatest kitten mule! Kim's traveling right now, but took lots of pictures of the kittens' trip. Once she returns, I'll share the pictures with you all. Here's one picture that my dad just sent of Nigel and Mimsey checking out their new kitty bed. I've got some more pictures from Dad, but they'll just have to wait until tomorrow. I'm running out of space, and running out of steam. I know you're all anxious to hear their story, so I'll just hit "post" and call it a day. What do kittens smell like? Why, they smell like heaven and rainbows and daisies of course! Thanks for posting the story again Laurie-it's so sweet, and so wonderful the way everything fell into place! It's lovely to see your Mom and Dad so happy with the baby (and now big!) Nigel and Mimsey! I re-read this story yesterday, Laurie, as I got all nostalgic remembering how your parents fell in love with the Frosts and how your Mum wanted to know what kittens smell like! A wonderful tale, thanks for re-posting (I missed it the first time).